How was your week? I hope you all enjoyed the spring weather, finally! I’m thrilled to finally be getting back outside and started walking again. I had activities every night this week and finally sat down last night to plan and start preparations for my club this month- nothing like cutting it close, whew. 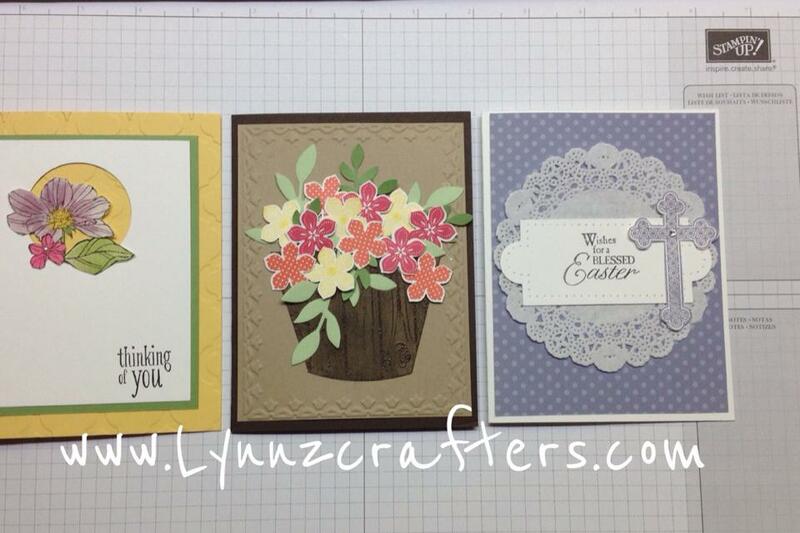 I did some case-ing (again), I was so inspired by some awesome cards by fellow demonstrators in our local Stampin’ Up! group. This first card was one we made last Sunday at our team get-together. The creators were Cathy K and Mary Beth W. Didn’t they do an awesome job? I love the watercolor paper- it holds up so nicely when you use the aqua painters. This second card was inspired by a card that the ever talented Jean Hall brought for our sharing table. 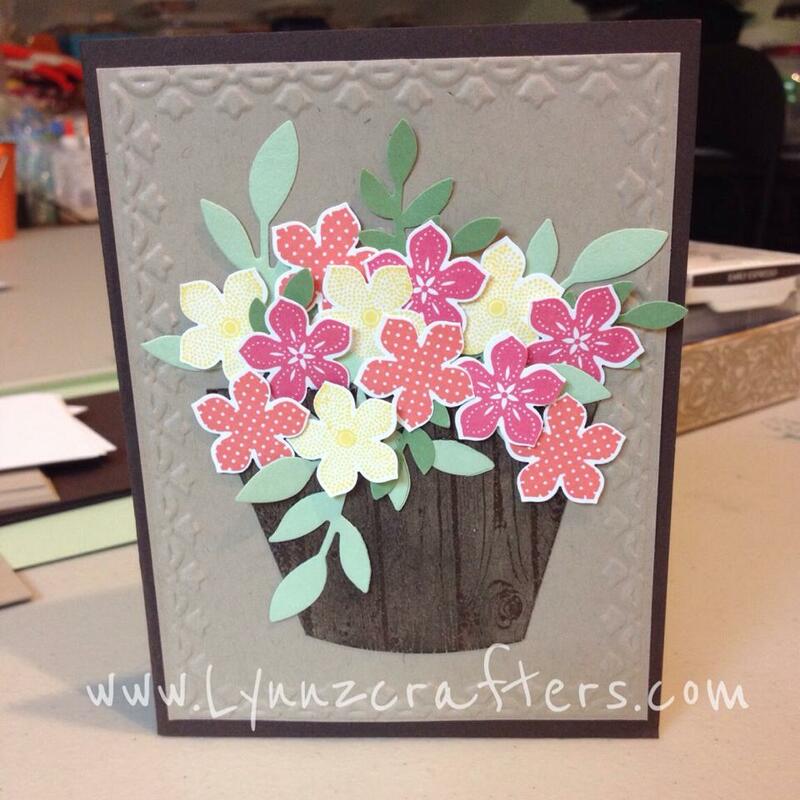 I loved how she used the new woodgrain big background stamp, embossed it in early espresso, and turned it into the flower pot. So cut and easy. Know how to turn it into a flower pot? Use the biggest oval framelit to get that curved edge on the bottom, then slice off the sides at the angle you want. Pretty easy. 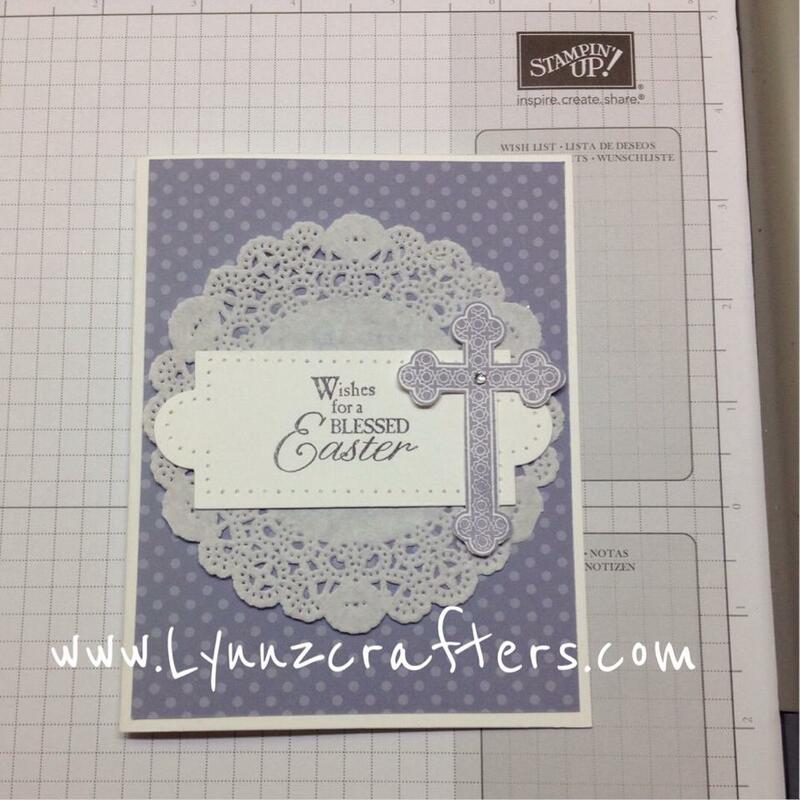 The third card for my April club ladies is one that I designed, I really wanted to use the Trefoil Cross (single stamp in the Annual Catalog). I pulled some Wisteria Wonder DSP from my retired stash, it really made the card complete. I love doilies, don’t you? This card could be easily turned into confirmation, first holy communion, sympathy, wedding, thinking of you, or pastor appreciation card. I have a busy weekend planned, how about you? Any stamping plans? Hey- I have a favor to ask you- could you let me know what handmade item you would be likely to purchase at a craft fair? I have limited time and so many ideas, but I want to narrow it down to what people might be most interested in. Don’t forget next Saturday is the Relay for Life Fundraiser at the Saratoga Holiday Inn on corner of Rt 9 and Rt 50 in Saratoga Springs. Hope to see you there! « Hudson Falls Craft Fair/Vendor Event Success!